Professional Peanut Butter Maker by Nostalgia Electrics. 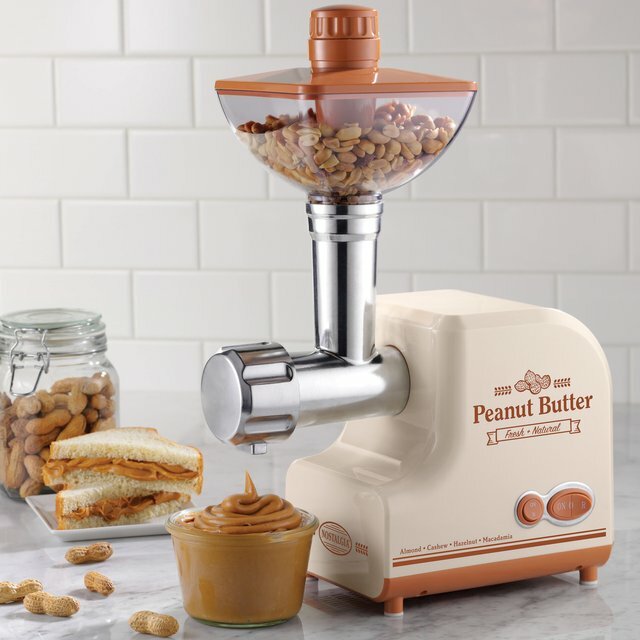 The Nostalgia PBM500 Professional Peanut Butter Maker quickly makes fresh and natural, spreadable, ready-to-eat nut butters with ease. Simply fill the large hopper with your favorite type of nut and switch on the unit. The powerful motor and durable die cast auger work together to dispense flavorful nut butter in a matter of seconds. Use the oil dispenser to achieve the perfect nut butter consistency. Finish by adding sweeterners and spices, like honey, sugar and cinnamon, to customize your creation! Try with almonds, cashews, hazelnuts, macadamia nuts, sunflower seeds and more.